Bea: Tiny pieces of trash such as plastic are killing our planet. Cities, touristic sites, nature and the oceans are overwhelmed by this pollution. Unfortunately, forecasts say that in a few years there will be more plastic than fish in the sea. Most people believe that it is complicated and impossible to save our planet or that it’s too late. Nonetheless, we believe we can do something about it. We are committed to change and find partners with whom we can share some simple solutions that will make the difference. Fred: With my wife we have spent half of our lives between Brazil and Switzerland. Between the sea and mountains. As children, we have seen a lot of pollution on our beaches caused by the largest port of Latin America and mass tourism. I remember that every evening, the beach looked like a huge open garbage. This is an ecological disaster… Despite the political efforts to reduce urban pollution and awareness-raising campaigns, there is still a lot of people who do not respect nature in the places they visit or live in. Bea: We have to take responsibility for our planet and it becomes more and more pressing to change our way of living. We are fighting to protect the place we love: Km 59 beach in la Carretera del Littoral in Salvador. We are thus calling for action local sites and tourists to join us and make a difference. We typically inform them on the consequences of pollution for our planet and future generations with the objective to engage them and motivate them to organize clean-ups. Fred: As a surfer, I would like to protect my favorite playground. We would like with my wife to change mentalities and help the local population in Salvador better understand the issues related to pollution in their habitat. We’ve been visiting Central America for a few years and we are chocked by the amount of trash found on the beach – in the Caribbean Sea but also the Pacific Ocean. 3 years ago, we have built a house in the Km 59 beach in la Carretera del Littoral in Salvador. This place is considered as a secret spot for surfing and is becoming more and more visited by tourists and surfers. Everyday we find trash (PET, flip flops, plastic bags, etc.) coming from the sea or the rivers and crashing on the beach and polluting the environment. We have decided to join My Green Trip to have a concrete impact on our beloved region and improve the quality of its fauna and flora as well as its inhabitants. Bea: During my travels, every time I pass by a school, I usually enter it spontaneously, without being invited. And every time, it is pure happiness. In Vietnam, my brother and I danced and sang “Savez-vous planter les choux…” (a French song) with the children in a school. We left them quite excited before leaving LOL. I can still hear their laughs of joy! Fred: We were holding the first reunion of the Committee to organize the first clean-up of the Km 59 in Salvador when one of the locals was so motivated by the conversation that he decided to start picking up trash on the beach right away. His wonderful energy spread across the group and we all took part in this informal clean-up. We picked up 10 bags of 100 liters in one hour. What a joy! 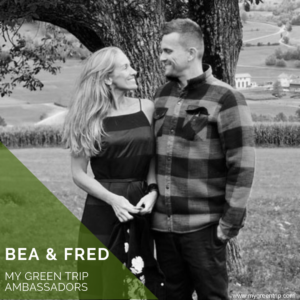 It is an amazing way to start our adventure with My Green Trip!